Presentations - Meghan R. Lowery, Ph.D.
Dr. Lowery presents on a wide variety of topics, notably research presentations. Stockdale, M.S., & Lowery, M.R. From Data to Impact: Insights from W2RN to Build Career Success . Workshop presented at Integrating Women Leaders Conference. Indianapolis, IN. Lowery, M.R. Towards Gender Parity - Leveraging Unique Analytics to Understand Men and Women at Work. Invited presentation, SIOP Leading Edge Consortium. Atlanta, GA.
Lowery, M.R. The Science of Men and Women at Work. 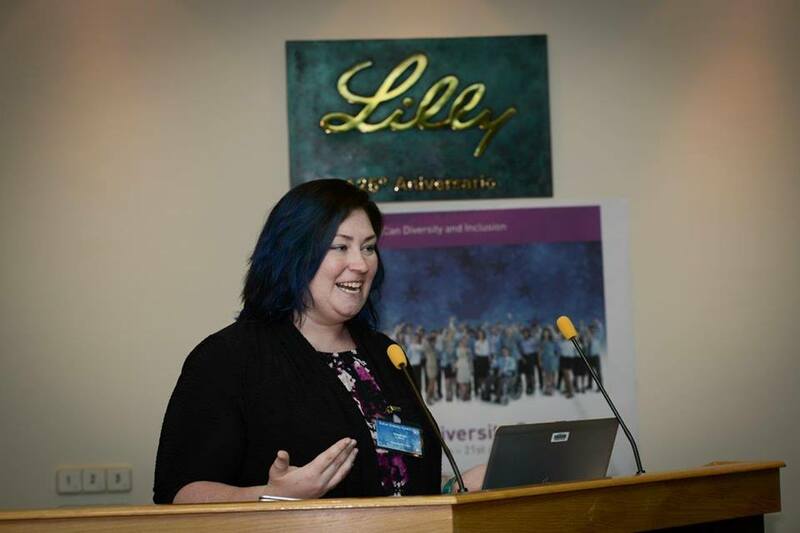 Invited presentation, Lilly's European/Canadian Diversity Summit. Alcobendas, Spain. Lowery, M. R., Smith, K., & Nadler, J. T. Weathering Difficult Economic Climates: Increasing Job Satisfaction without Increasing Salaries. Paper accepted for presentation at the Midwestern Psychology Association (MPA) annual conference. Chicago, IL. Chance, R., Cameron, S., & Lowery, M.R. Best Practices in Program Evaluation with Elementary School Children: A Real World Case Study. Paper accepted for presentation at the Midwestern Psychological Association (MPA) annual conference. Chicago, IL. Lowery, M. R., & Nadler, J. T. University Salaries: Gender Gaps in Pay, But What about Performance? Paper presented at the 2013 annual meeting of the Society for Personality and Social Psychology (SPSP). New Orleans, LA. Lowery, M. R., & Nadler, J. T. The Current State of Women in the Workplace. Paper in J. T. Nadler (Chair) Bias in Organizational Decisions and Perceptions: Gender, Ethnicity, and Culture. Symposium presentation at the 2012 annual meeting of the American Psychological Association (APA). Orlando, FL. Lowery, M.R. Gender Differences in Faculty Salaries: Do Women Teach Tougher Classes? Paper presented at the 2012 annual meeting of the Society for the Psychological Study of Social Issues (SPSSI). Charlotte, NC. Nadler, J. T., Lowery, M. R., Stockdale, M. S. Sexual Harassment: The Targets, the Employers, and the Accused. Paper presented at the 2012 annual meeting of the Society for the Psychological Study of Social Issues (SPSSI). Charlotte, NC. Lowery, M. R., & Nadler, J. T. Risk-Taking and the Compensation Preference Scale. Poster presented at the 2012 annual meeting of the Society for Industrial and Organizational Psychology (SIOP). San Diego, CA. Lowery, M. R., Nadler, J. T., & Zabrowski, A. Risk-Taking and the Compensation Preference Scale. Poster presented at the annual meeting of the Association of Psychology Science (APS), Washington, D.C.
Lowery, M. R., & Nadler, J. T. Gender Differences in Workplace Preferences for Compensation. Paper presented at Society for the Psychological Study of Social Issues, New Orleans, LA. Doener, J., Richardson, S., Rion, R., Smeltzer, S., Lowery, M. R., & Nadler, J. T. Gender differences in career decisions: Effects on job and life satisfaction. Poster presented at the Midwestern Psychology Association (MPA) annual conference. Chicago, IL. Lowery, M. R., & Nadler, J. T. The role of gender, personality, and work experiences in risk-taking. Poster presented at the Annual meeting of the Society for Personality and Social Psychology, Las Vegas, NV. Nadler, J. T., Lowery, M. R, & Hentrich, M. M. Gender bias in perceptions of prescriptive stereotypes of managers. Poster presented at the Annual meeting of the Society for Personality and Social Psychology, Las Vegas, NV. Lowery, M.R. , & Hoffman, N. When non-monetary benefits outweigh cost: choosing a pro-bono project. Paper presented at the American Evaluation Association Annual Conference, Orlando, FL. Lowery, M.R., & Nadler, J.T. It’s a beloved part of our culture, but we aren’t sure it works: An evaluation of a new employee orientation program. Paper presented at the American Evaluation Association Annual Conference, Orlando, FL. Hoffman, N., Lowery, M.R., & Berry, S. Who owns it? A discussion concerning the ownership of data in an evaluation setting. Paper presented at the American Evaluation Association Annual Conference, Orlando, FL. Voyles, E.C., Hentrich, M.M., Nadler, J.T., & Lowery, M.R. Perceptions of the value of a romantic partner when external interest is present. Poster presented at the biannual conference of the International Association for Relationships Research (IARR) in Lawrence, KS. Walmsley, P.T., Lowery, M.R., Shoptaugh, C.F., Curry, S., Adrignola, A.M., & Lauer, C. Developing a taxonomy of the underlying causes of human error: a multi-level perspective. Invited symposium presented at the Annual Conference for the American Psychological Association, Toronto, Canada. Nadler, J. T., & Lowery, M. R. Locus of control in workplace attributions. Poster presented at the Midwest Psychological Association. Chicago, IL. Nadler, J. T., Lowery, M. R., Voyles, E., & Hentrich, M. Perceptions of leadership: Situational determinations. Poster presented at the Midwest Psychological Association. Chicago, IL. Lowery, M.R., & Nadler, J.T. The Effects of Gender, Manager Level, and Situational Constraints on Performance Evaluations. Poster presented at the 24th Annual Conference of the Society for Industrial and Organizational Psychology, New Orleans, L.A.
Hentrich, M. M., Voyles, E. C., Nadler, J. T., & Lowery, M.R. The Glass Ceiling: The Impact of Higher Education on Women’s Workplace Perceptions. Poster presented at STLAURS St. Louis Area Undergraduate Research Symposium. St. Louis, MO. Lowery, M.R. (2009, February). Ethical Considerations in Constructing Consulting Contracts. Professional development presentation at Southern Illinois University, Carbondale, IL. Lowery, M.R., Nadler, J.T., & Castilla, T.M. Beyond problem-based experiential learning: an applied research training practicum. Presented at the American Evaluation Association Annual Conference, Denver, CO.
Pankey, K.N., Lowery, M.R., & Nadler, J.T. Current and lapsed membership: evaluating a university alumni database. Presented at the American Evaluation Association Annual Conference, Denver, CO.
Bhattacharya, G., Lowery, M.R., & Advic, A. Evaluabiltiy assessment: what makes a program ready for evaluation? Presented at the American Evaluation Association Annual Conference, Denver, CO.
Nadler, J.T., Lowery, M.R., Hoffman, N.G., & Bhattacharya, G. A university public service survey, the (de)evolution of a project. Presented at the American Evaluation Association Annual Conference, Denver, CO.
Nadler, J.T., & Lowery, M.R. Emotional expression, gender, personality, and workplace appropriate behaviors. Paper presented at the 6th International Conference on Emotions and Worklife, Emonet VI, Fontainebleau, France. Nadler, J.T., & Lowery, M.R. Gender differences in law school experiences. Presented at the Midwest Applied Psychology Conference, Carbondale, IL. Lowery, M.R., Nadler, J.T., Hoffman, N.G. Needs assessment: a scientific approach to organizational initiatives. Presented at the Midwest Applied Psychology Conference, Carbondale, IL. Lowery, M.R. & Nadler, J.T. Emotional intelligence, benevolent and hostile sexism and agentic/communal workplace attributions. Presented at the 7th Biennial Society for the Psychological Study of Social Issues Convention, Chicago, IL. Lowery, M.R., & Phelps, J.A. The effect of discretionary salary adjustments on male and female faculty salaries. Presented at the 20th Annual APS Annual Convention, Chicago, IL. Nadler, J.T., Cundiff, N.L., Lowery, M.R., & Jackson, S. Job favorability and attractiveness as a function of work flexibility. Presented at the 23rd Annual Conference of the Society for Industrial and Organizational Psychology, San Francisco, CA. Walmsley, P.T., Lowery, M.R., Curry, S., Adrignola, A.M., & Lauer, C. Inter-rater reliability in an investigation of the underlying causes of human error: a multi-level perspective. Presented at the Annual College of Health and Human Services Research Symposium, Springfield, MO. Lowery, M.R., & Walmsley, P.T. An Investigation of the Underlying Causes of Human Error: A Multi-Level Perspective. Presented at the 14th Annual Graduate Interdisciplinary Forum, Springfield, MO. Lowery, M.R. An Academic Program Needs Assessment. Presented at the 13th Annual Graduate Interdisciplinary Forum, Springfield, MO.